The U.S. Census Bureau lists Hispanics are the largest ethnic or racial minority in the United States, forming about 17% of the nation's population, according to 2014 population numbers. In all there are over 55 million Hispanics in the United States. That means there are a lot of abuelos. The term Hispanic as used by the U.S. Census Bureau refers to persons with roots in Mexico, Central America, South America, Puerto Rico and certain Caribbean nations. Given the diversity of these regions, one would expect to find diversity in the roles of Hispanic grandparents. While there are some variations, some generalizations appear to be true for most with Hispanic or Latino roots. Large, close-knit families are typical, with grandparents playing important roles. Another area in which there is little variation is in grandparent names. Since Spanish is the native tongue of almost all Hispanics' countries of origin, there is not much diversity in grandparent names. Grandfathers are called the formal Abuelo or the informal Abuelito. Grandmothers are called Abuela or Abuelita. Shortened forms such as Lito and Lita or Tito and Tita are common. In Brazil families use the Portuguese term for grandmother, Avó or the Portuguese term for grandfather, Avô. Note that the spelling is the same but the pronunciation is different. The common image of Hispanics having large, warm extended families has a basis in fact. Hispanics do have larger families than non-Hispanics. In the United States, the average Hispanic family consists of 3.87 individuals, as opposed to the national average of 3.19. When they need help or information, Hispanics are likely to turn to family and friends first, before resorting to outside agencies. In part, this tendency can be traced to difficulties with English. Almost three-fourths of Hispanics speak Spanish in the home. Although about half of those individuals also speak English very well, that still leaves a significant number with some language difficulties. In addition, Hispanics are more likely than the population at large to live in poverty and to be uninsured. These circumstances also may influence their tendency to seek help from friends and family. According to the Census Bureau, Hispanics are less likely than whites, blacks, or Asians to live alone. In addition, they are more likely to want to stay geographically close to family members. They are seldom long-distance grandparents by choice. Grandparents are typically respected family members who view themselves as important in the lives of their grandchildren and who prefer living near their children or with them in a multigenerational home. 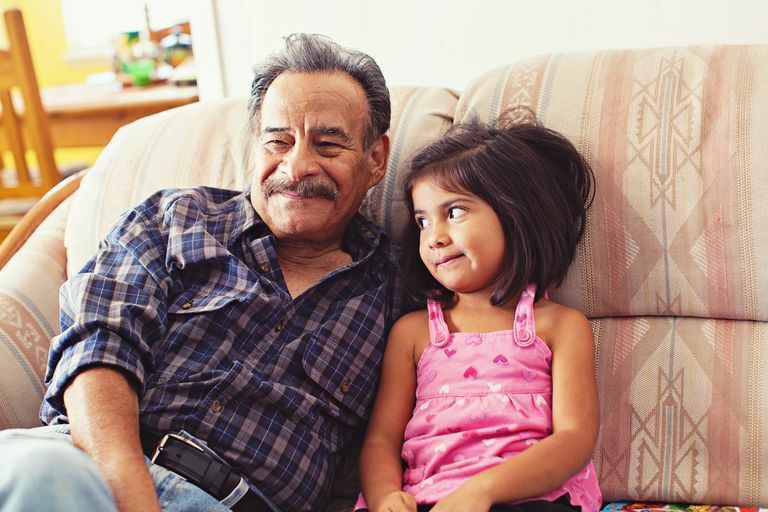 Hispanic grandparents tend to play traditional roles. The glamorous granny and globetrotting grandfather are rare in this culture. One researcher has found that Mexican-Americans view themselves as "old" at age 60, earlier than black Americans (65) and non-Hispanic whites (70). Paradoxically, in spite of viewing themselves as old, Hispanics in America live longer than the other two groups. At least one doctor believes that family solidarity is a causative factor. "The sense of family is what saves Latinos," says René Rodríguez, president of the Interamerican College of Physicians and Surgeons. "Solid family ties are essential for preserving health. When someone of Hispanic origin gets sick, the whole family shows up worried at the clinic or hospital. This support, this solidarity, is an essential part of Latino life." Research shows that Hispanic grandparents believe that they are important in the lives of their grandchildren; that they should be ready to raise their grandchildren if necessary; that they should help out in times of crisis; that they can and should have input into decisions made about their grandchildren. Grandparents also see themselves as emissaries of religion, the Spanish language and Hispanic culture in general, but this role is emphasized less as Hispanics become more acculturated. The closeness of Hispanic families isn't without stresses. Grandparents may worry excessively about family problems or may feel that they must be the peacemakers when family disputes occur. One study suggests that grandparents often give more assistance than they receive. Children and grandchildren are often busy with work and school and thus unable to devote much time to the grandparents' needs. Andaló, Paula. "Health for One and All: Latinos in the USA." Perspectives in Health. Volume 9, Number 1, 2004. "Hispanic Elderly." Center on Aging. University of Missouri HES Extension. ​University of Missouri-Kansas City. Williams, Norma, and Diana J. Torrez. "Grandparenthood Among Hispanics." Handbook on Grandparenthood. Ed. Maximiliane E. Szinovácz. Greenwood Publishing. 1998. 87-96. Google Books.